This ultra-glossy, ultra-smooth fibre paper was designed to replicate the fibre-based papers traditionally used in darkroom processing. Universally compatible with dye and pigmented inks, this is a great choice for the photographer, artist or reproduction company that requires a high-end look for their work. 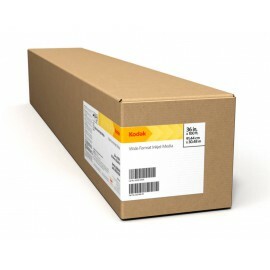 Engineered to lay flat with little to no curl for smooth, trouble-free print production, KODAK PROFESSIONAL Inkjet Photo Paper, Glossy Finish has been updated to take advantage of the wider color gamut and improved ink technology of the latest generation of wide format printers from Canon, Epson and HP. This next-generation paper has a larger color gamut and higher Dmax to ensure that colors captured in-camera reproduce more accurately, while producing deeper, richer black, an expanded dynamic range and additional detail in shadow areas. The next-generation KODAK PROFESSIONAL Inkjet Photo Paper, Metallic Finish allows users to produce stunning metallic prints previously only available in a traditional darkroom. The metallic, high gloss finish duplicates the characteristics of similar pearlescent darkroom papers users have preferred for years. It has a larger color gamut and higher Dmax to ensure that color captured in-camera reproduces more accurately, while producing deeper, richer blacks, an expanded dynamic range and additional detail in shadow areas. 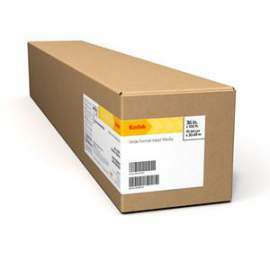 This paper is compatible with all leading dye and pigment photo inkjet printers. KODAK PROFESSIONAL Inkjet Smooth Canvas, Matte Finish / 365g is a smooth, poly/cotton canvas, featuring a 2-over-1 weave and a water-resistant matte inkjet coating rendering it the perfect choice for high-end photographic gallery-wraps. The high-performing inkjet receptive coating is engineered to work with the latest dye and pigmented inks and will not crack when stretched.